If poetry can carry us through the difficult waters of our emotions, then this collection is your bad-weather friend. “I did lots of things last night my body wasn’t happy with” - haven’t we all been there? Or the opening lines of the title poem, “sleeping in broken pieces, the rusted wreckage of an unmade night” – doesn’t that sound familiar? Jim Freeman felt compelled to jot down the feeling of that particular night and pass it on. It’s like adding another word to our emotional vocabulary to tell us we’re not alone with these feelings, not the only ones with sleepless nights. We see ourselves and our lives in occasionally clear but mostly confused prose, but we can dream in poetry. We can use the broken pieces to build something new, like using a broken mirror to make a mosaic. 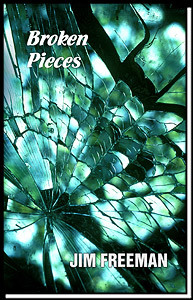 While in The Smell of Tweed and Tobacco Freeman explores relationships and in Corner of My Mind looks more introspectively at love and personal issues, Broken Pieces is a poetry collection looking outward, reflecting bits and pieces of our world and the writing process as such. The themes here span from sailing, duck and elk hunting trips, to traveling Europe, exploring different cultures, perhaps even shedding light on burning social or political issues. Men might find these themes especially familiar and appealing and women can gain a quick insight into how guys think and what they dream of.